7080 S3/4u.a. Posthorn, six various se-tenants, unfolded, in perfect condition mint never hinged (Michel no. W1 / 3, S1, S3 / 4). Michel 360,- €. 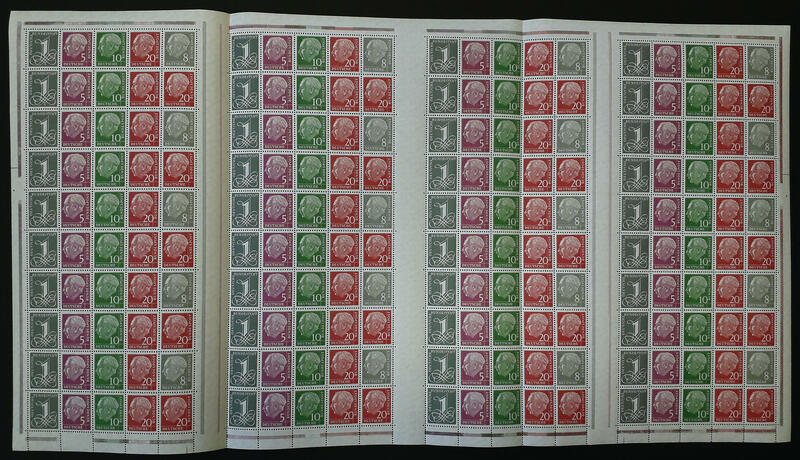 7081 S5,10/12 Posthorn, five vertical se-tenants, in perfect condition mint never hinged, without any signs. Michel 178,- €. 7082 S6 20 Pfg. Posthorn - St. Andrews cross - 20 Pfg. 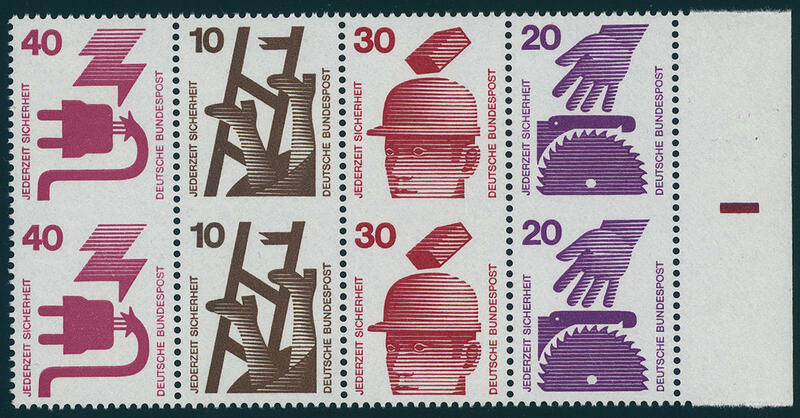 Posthorn, vertical se-tenant, left with gutter extension, fresh colors and very well perforated, unfolded, in perfect condition mint never hinged, without any signs. Michel 800,- €. 7083 S6 Posthorn, 20 Pfg. 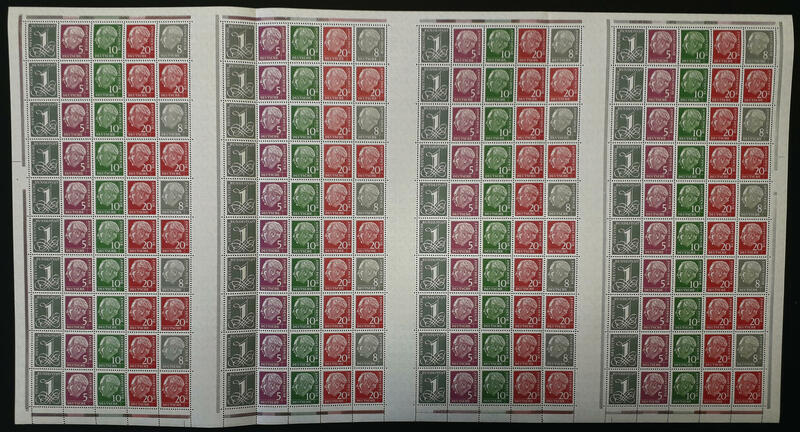 X20 Pfg., vertical se-tenants, unfolded, fresh colors and very well perforated, in perfect condition mint never hinged, without any signs. Michel 800,- €. 7084 S6 20 Pfg. Posthorn-X-20 Pfg. Posthorn, vertical se-tenant, fresh colors and very well perforated, in perfect condition mint never hinged, unfolded and without any signs. Michel 800,- €. 7085 ⊙ S6 Posthorn, 20 Pfg. X20 Pfg., vertical se-tenant, neat cancelled \"Berlin Wilmersdorf 19.11.53. \", expertized Schlegel BPP. Michel 1100,- €. 7086 ⊙ S7 Posthorn, X-20 Pfg., vertical se-tenant, in perfect condition and neat cancelled \"BREMERHAVEN 15.4.53. \", expertized Schlegel BPP. Michel 700,- €. 7087 S8 Posthorn, X-20 Pfg. 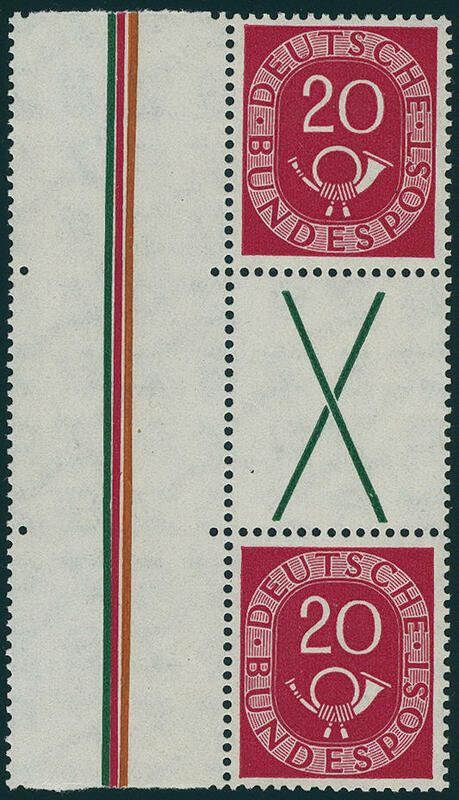 X, vertical se-tenant, fresh colors and very well perforated, unfolded, in perfect condition mint never hinged, without any signs. Michel 950,- €. 7088 ⊙ S8 Posthorn, X-20 Pfg. X, vertical se-tenant, neat cancelled, photo expertize Hans-Dieter Schlegel BPP. Michel 1000,- €. 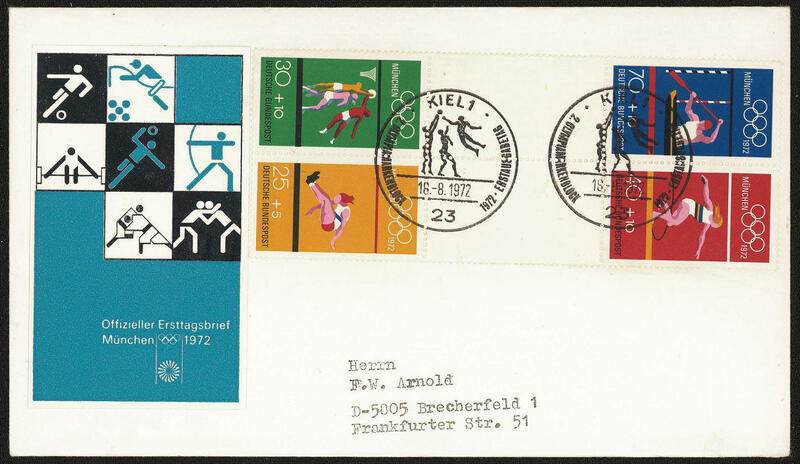 7089 FDC SZ1a/Yb Olympic Spiele1972, all fours gutter pairs on two illustrated First Day Cover. Michel 280,- €. 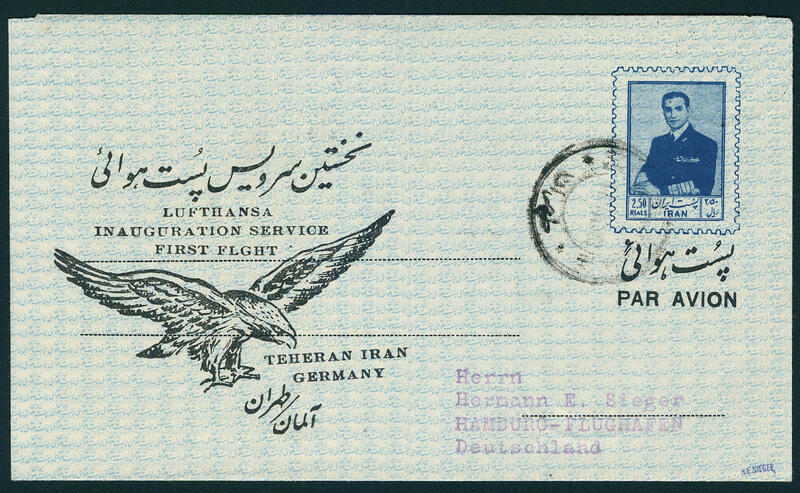 7125 ✉ Lufthansa, the sought Tehran return flight letter from 1956, airmail letter sheet with on the back additional franking and arrival postmark \"Hamburg airport 18.9.56. \". Very small edition! Expertized Sieger. 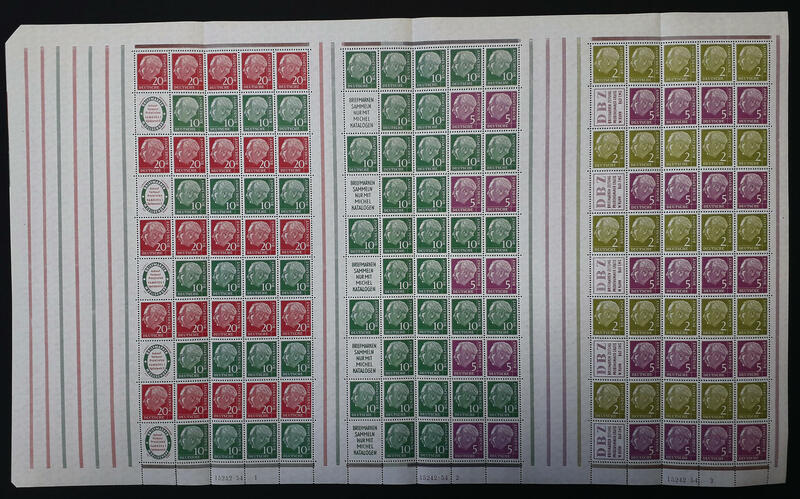 7113 3 Heuss 1955, the complete stamp booklet sheet with house order number \"15242.54\", as usual from of the philatelic agency three times in the perforation vertical prefolded, in perfect condition mint never hinged at rare intervals offered! Michel 2000,- €. 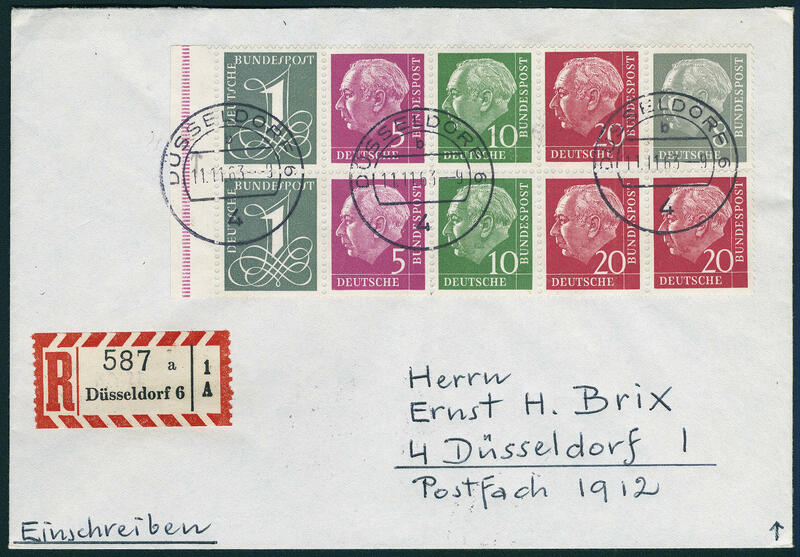 7114 5X Heuss watermark upright, the complete stamp booklet sheet, as usual from of the philatelic agency twice vertical in the perforation prefolded, in perfect condition mint never hinged Michel 750,- €. 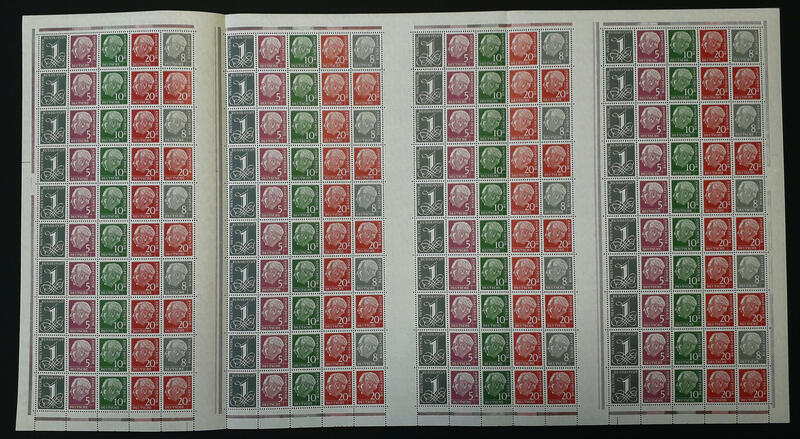 7115 5YI/I Heuss watermark sideways, the very scarce stamp booklet sheet in the first issue, as usual from of the philatelic agency twice vertical in the perforation prefolded, in perfect condition mint never hinged rare offered! Michel 2800,- €. 7116 5YII Heuss watermark sideways, complete stamp booklet sheet of 20 each stamp booklet panes, as usual twice with vertical philatelic agency folding, in perfect condition mint never hinged Michel 2200,- €. 7117 5YII Heuss watermark sideways, reprinted edition, the complete stamp booklet sheet, as usual from of the philatelic agency twice vertical prefolded, in perfect condition mint never hinged Michel 2200,- €. 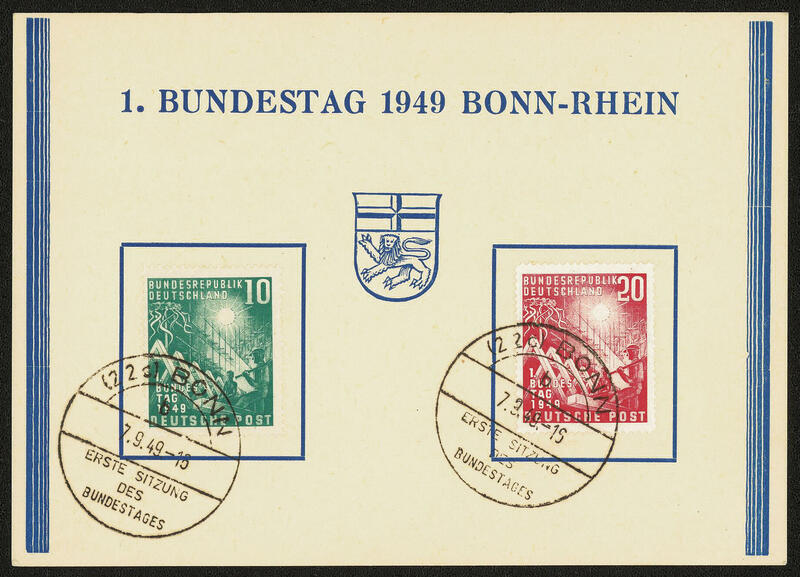 7118 ✉ 8YII Heuss watermark sideways, stamp booklet pane with margin, in perfect condition on not correctly franked registered local letter, perfect used \"DÜSSELDORF 11.11.63. \". Photo expertize \"the quality is perfect\" Andrew Schlegel BPP. 7119 25UM Prevention of accidents 1974, the stamp booklet pane in the middle unperforated, above and at the bottom perforated, from right margin, unfolded, in perfect condition mint never hinged the origin is undetermined, therefore becomes this unequivocal genuine piece current unaudited. Probably it concerns an a proof for stamp booklet sheet, which however absent are. A significant rarity! 6787 ✉ 111/12 Lower House of German Parliament 1949 in good combination with Rhineland-Palatinate 8 Pfg. Porta Nigra on decorative not correctly franked postcard with interesting text from \"NEUWIED 24.9.49. \" to Ottweiler / Saar. An attractive and extraordinary combination! 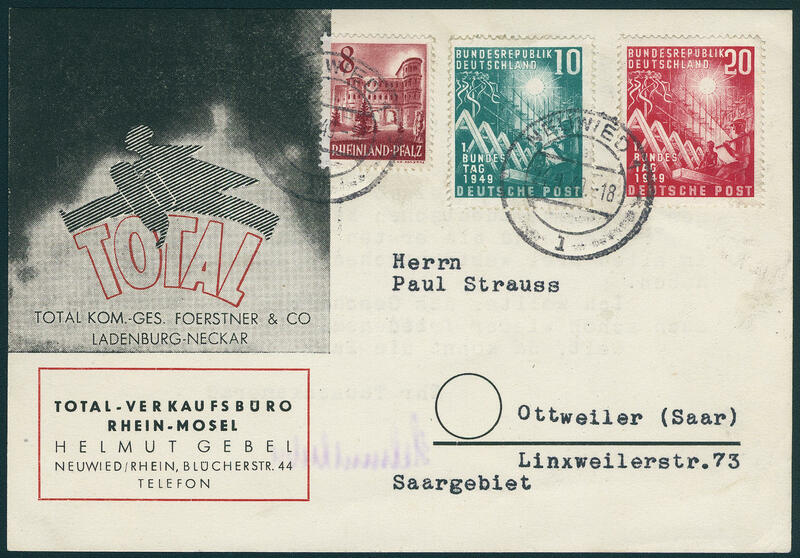 6788 FDC 111/12 Lower House of German Parliament 1949 on very nice First day card with appropriate first day special cancel \"BONN 1. Session of the Lower House of the German Federal Parliament 7.9.49. \".